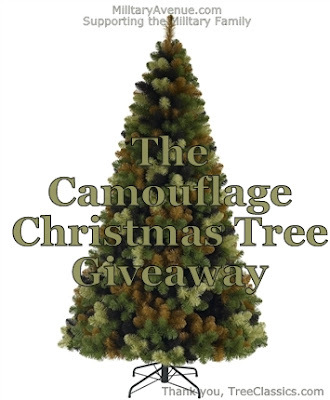 We have one Camouflage Christmas Tree to give away from TreeClassics.com! I think it would be perfect for a Family Readiness Group or Military Spouse Group to display. It would be lovely in an office or in an armory. It would look splendid in a home or perhaps the home away from home, like Afghanistan, Korea, or perhaps a ship in the middle of the ocean. The possibilities are endless! To be entered for our random drawing tell us about your Christmas tree; the style, favorite decoration, any little nuance you want to share. Mention each of these new ways you have connected with us in your comment so we can put your name in "the hat" for each chance. We need to be able to contact you if your name is drawn on Friday, December 21st. So be sure to leave your email address in your comments as well -or- send an email to leanne@militaryavenue.com after you comment on the blog if you don't want to put your email address in a public forum. We will announce a winner on Friday, December 21st. So enter today! Thank you to TreeClassics.com for reaching out to us to give a tree to a military family. They will ship it directly to our winner which will be ready for your display Christmas 2013. We alwayshave a yellow ribbon on our tree for all of the servicemembers away from home. Like you on Facebook and follow you on Twitter and Pinterest! Thank you, Cristina, for your entry! Be sure to either send me your email address via email (leanne@militaryavenue.com) or reply here, so that if your name is drawn we can contact you. Thanks, Cristina! I received your email. Good luck! Our tree is mostly preschool type homemade ornaments! Like you on FB and Pinterest. Thank you, Jennifer. I received your email with your address. Good luck! We also tie a yellow ribbon on our tree and have our little army hat we hang at the top :) Love you all on Facebook! Thank you, Kristal. I received your email. Good Luck! I like Military Ave on Facebook, Pintrest, and now Twitter :D. Thanks for all that you do! This Christmas me and my daughter are staying with family while my husband is deployed. Our Christmas tree here is decorated with colorful lights, tinsel, and vintage ornaments. I need to find a yellow ribbon! My tree has always been ornaments made by my kids with ones that have been given to us. We have two trees. In our main room is the formal tree with Maroon and silver ornaments. There is no Angel on top of the tree this year as it is tradition for daddy to put the Angel on as the final touch and he is deployed. Our second tree on the second floor is made up of all our special ornaments we have collected over the years. From First Christmas' to those special homemade ones, to ornaments bought from special places we visited. That tree is strictly decorated by our daughters. I love the idea of the yellow ribbon and may add that to our second tree since daddy is gone this Christmas. I follow you on Facebook and Pinterest. Happy Holidays. Thank you, Alyssa, for your entry! Be sure to either send me your email address via email (leanne@militaryavenue.com) or reply here, so that if your name is drawn we can contact you. I want this camouflage tree!!!! I have a black tree that serves as my Army tree. It is decorated in black and gold for ARMY and I keep it up all year long in honor of my two amazing sons who are both serving in Afghanistan along with all of our brave service men and women all over the world. It is filled with army ornaments. This year I did a mostly Disney theme, my favorite ornament on it is one my husband and I got personalized at Disney World this summer as our trip before he deployed. It's pretty loud but since it's just me this year I do what I want! :) I'd love to add a camo tree to my collection! Please and thank you! My daughters decided they wanted a REAL Charlie Brown Christmas tree so I picked them out a real tree since we are stationed in Germany things are a little different we decided to decorate our tree with popcorn and cranberry garland, mini gold lights, plain natural colored wood ornaments, German Chocolate Ornaments, real mini Christmas candles as well as a string of fake Christmas candles, a pickle ornament, a slice of bacon ornament for my husband and little elves.